For a summer in 2003, my PC was broken and I was stuck with the family model, an off-the-shelf job from a now defunct retailer with integrated graphics and very little grunt to speak of. The thing couldn't run Deus Ex, a game I'd been hammering for the past year. Instead, what I got was Soldat, a fast-paced 2D blaster that pits team against team in an over the top brawl. Soldat still exists, but it's 15 years old. Picking up that two-dimensional, team-based torch is Cobalt WASD. 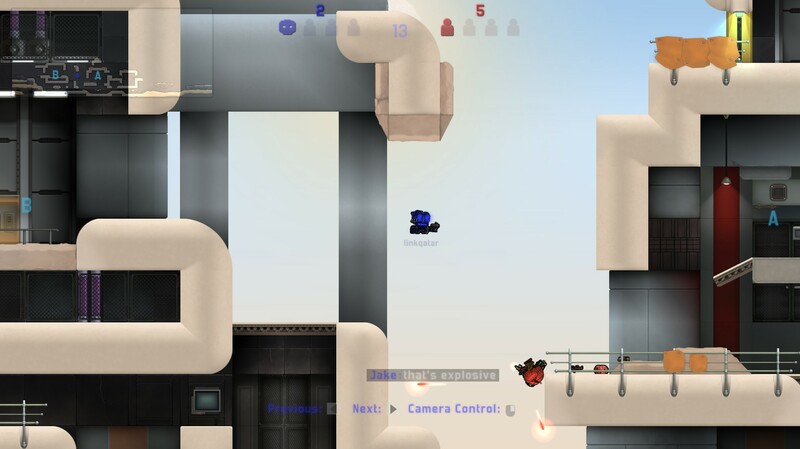 Cobalt WASD is Counter-Strike under a rolling pin, a sci-fi shooter that sees you, as a team of computers, trying to outwit your PC enemies with jump-jets, rocket launchers, and an arsenal of futuristic weaponry that would make a terminator blush. 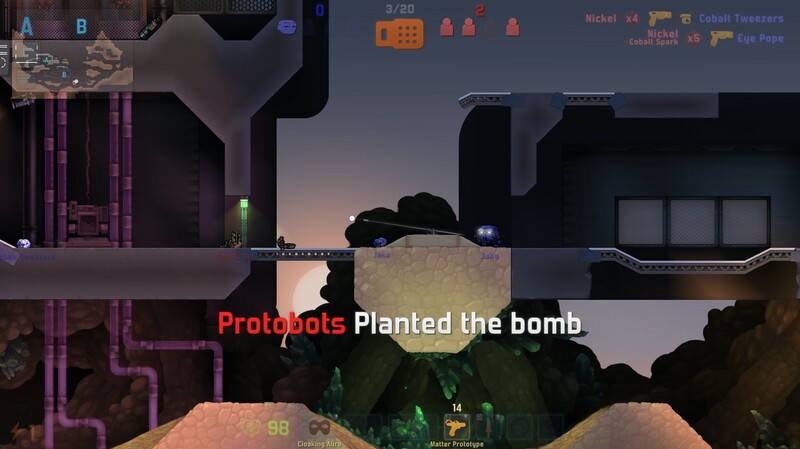 Cobalt WASD hasn't generated a lot of buzz leading up to its release last week, but it's been published by Mojang (the Minecraft guys), and it's a well put together multiplayer experience with a lot of charm and - whisper it - a pretty decent community. 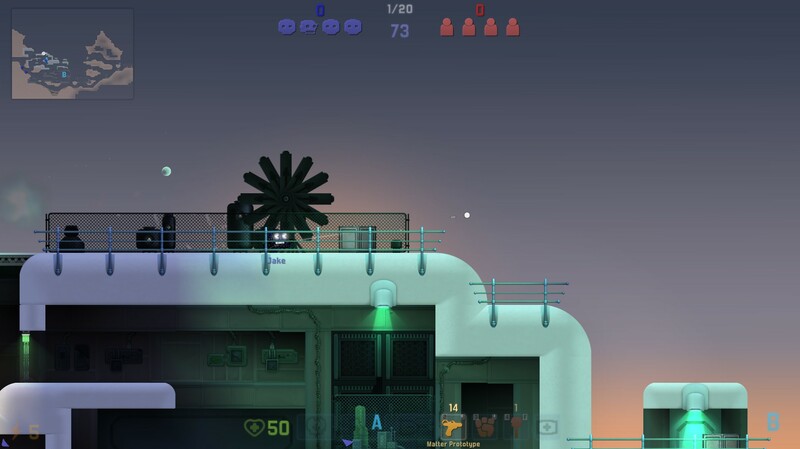 When I settled in to play WASD, I wasn't entirely sure what I'd get, but it's a remarkably competent game, and there are a series of smart design choices wrapped around the core of a shooter that has you leaping from platform to platform, tossing grenades, gadgets, and gore all around the place. This is a one-death-and-you're-out combat scenario, played across small maps with tight firefights. The time-to-kill is low, and rounds are frenetic, with players changing routes or diving in and out of firefights as casualties mount up on both sides. 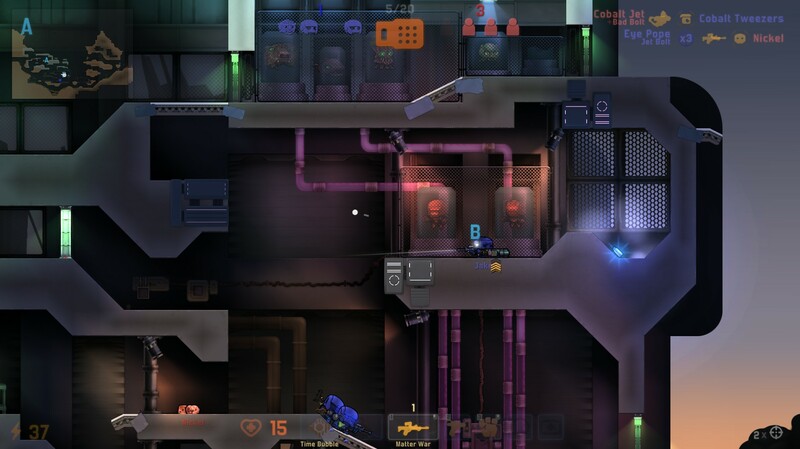 The round-based format and high-tech gadgetry make it reminiscent in many ways of PC/Xbox 360 near-miss Shadowrun in the way that it subverts so many design choices in multiplayer shooters, but it manages to one-up Shadowrun by being actually interesting, unafraid to take risks with the expected design of a multiplayer shooter. The game's health kits are one of my favourite things about it. You can buy health kits at the start of the round in the buy area, and they sit in your grenade slot. If you're damaged you can toss one out in front of you and heal: This is expected, almost normal. But you can also drop one down on a dead teammate to revive them after a time, or you can drop them in an area you think a teammate might die in later, and it'll lay there waiting to be activated. If you're going to guard a bomb defusal or plant, you could toss a health kit down in anticipation of your own brutal murder, all so you can live again. Hell, you could skip all that and run back to the buy zone to pick up healing for your dead friends as the sole survivor, turning a 1 v 4 clutch into a fair fight with the judicious application of healing. There are so many ideas here, working out strategies for each piece of kit takes some doing. Better yet, both the attack and defence side have their own arsenals, and the shooters on offer have some unique attributes: One grenade launcher teleports you to the point of impact each time you fire, which I still haven't found a use for, beyond delivering yourself into the middle of the enemy team and then cutting loose with a sword. Not that that isn't effective, mind you, but I also have thoughts of how that might interact with the suit that turns me invisible, or even the massive stick of dynamite that blows every enemy near me into chunks. Fire yourself into the middle of the enemies with the grenade launcher, and you've got a decent chance of hitting them in the face with the dynamite so that the enemy team goes up (with you) in a massive fireball. Victory at all costs, eh? So far I've pulled out the specifics of just a handful of items in a fairly expansive selection, and with everyone focusing on their own items and trying to set up sniper rifle shots, lure people into proximity mines, or even just get the hang of the stompy mechanised units that well-off players can buy, each round devolves into chaos, punctuated with heroism as a plan comes off perfectly or, more often, something dumb happens and you survive. This gets even more ridiculous when you add in the time manipulating aspect of the game, with suits allowing you to turn on a localised time distortion field, making it easier to dodge incoming grenades, rockets, and small-arms fire. Learning to dance between the gunfight, even in slow motion, takes some practice. There are even time grenades, which are the same thing but portable, offering a wealth more possibilities. The game has a strong aesthetic, although sometimes in the heat of the battle the smudgy graphics can be tough to distinguish, but I generally found it to be readable as long as I wasn't in the middle of a firefight, although I was nearly always in the middle of a firefight. Combat isn't too hectic to keep tabs on outside of visual confusion though. There's a bedding in period to get used to the weird and wonderful weapons, but otherwise it handles fairly well, is sturdy, and feels decent. It doesn't feel as tight as I'd want in the moment-to-moment combat frequently, but I think a lot of this is from the side-scrolling combat, which naturally has a little less flexibility. I also think there's been an active choice to make this as easy to pick up as possible, resulting in a learning curve as shallow as a paddling pool. 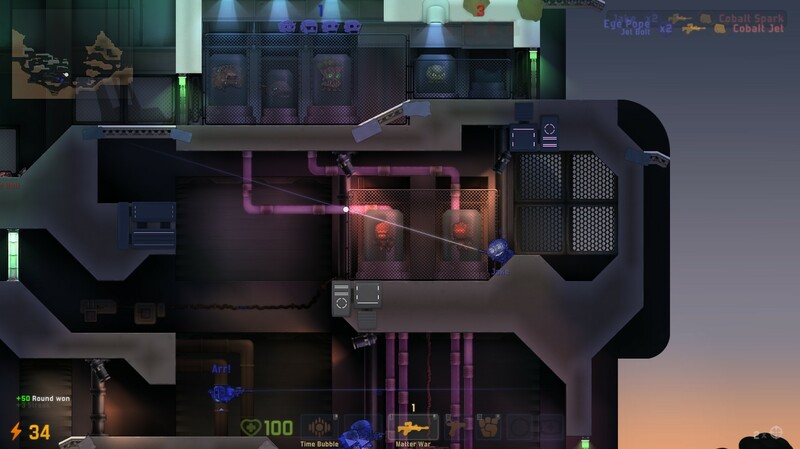 Cobalt WASD was never going to be the next must-have multiplayer game, but it's bursting with ideas, and if you overlook it because it's 2D or because Mojang seems to have declined to market it at all, you'll miss a game that's consistently entertaining and frequently outright amusing. At a fiver for entry, I'm inclined to recommend it to anyone with friends that play games together, casual shooter fans, or anyone with £5 to spare. This is pretty good fun; it's just not likely to stick in your head for long. Want to comment? Please log in.